The Black Grouse Blended Scotch Whisky and the RSPB are joining forces to launch a series of exclusive whisky tastings combined with the opportunity to watch one of the most exciting nature spectacles in Britain. Back by popular demand, the black grouse safaris will run Friday to Sunday for the whole month of April at Corrimony nature reserve, which occupies 1,530 hectares of stunning moorland and Caledonian forest south-west of Inverness. The black grouse safaris at RSPB Corrimony nature reserve offer the opportunity to view one of Britain’s most strikingly beautiful game birds as they perform in an extraordinary courtship ritual known as lekking. 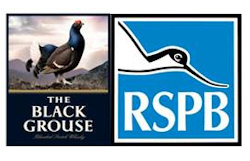 The Black Grouse Blended Scotch Whisky and the RSPB in 2008. Since then a total of £300,000 has been raised towards the conservation effort, and a further £150,000 has been committed to fund work on five reserves across the UK over the next three years. This brings the total amount donated to £450,000. Nature enthusiasts will also be invited to an in-depth nosing and tasting of the The Famous Grouse Family - including The Black Grouse, The Snow Grouse and The Famous Grouse. Since the beginning of the partnership, £74,000 has been donated to the Corrimony nature reserve from sales of the whisky to fund the urgently required conservation. Over the past year, £13,000 has helped fund planting over 20,000 trees, restructuring over 200 hectares of woodland, felling over 30 hectares of exotic trees, cutting and burning of heather moor, managing cattle, undertaking black grouse counts and offering local landowners advice. All safaris will start at 6am from the Cannich Village Hall and will be led by RSPB staff. The safari will last 2 ½ hours and includes breakfast at Bog Cotton Café. Everyone attending will also receive a free miniature* of The Black Grouse and an invitation to a tutored nosing and tasting of The Famous Grouse range. The tastings will take place at Glenurquhart House Hotel every Saturday in April from 8pm. To book a black grouse safari email blackgrousesafaris@rspb.org.uk or phone 01463 715 000. For more information please visit www.rspb.org.uk/events.